The Workers Unite Film Festival was thrilled to take part in the Fourth Annual Global Labor Film Festival Organizers Conference, this past October 7th to 9th, in Washington, DC. The Conference, co -founded and mobilized by Chris Garlock, founder and director of the Washington, DC Labor Film Fest and mobilization director for the DC Central Labor Council and co-founded by Joslyn Williams, the Executive Director of Washington DC, District Labor Council. This year’s conference drew thirty worker/labor film festival organizers from as far away as Pakistan (Amar Aziz, a brilliant and courageous filmmaker and activist for labor rights), Taiwan, the UK and from every part of the U.S. The attendees to the event were honored to have the conference moved to a new location -the headquarters of the AFL-CIO, and to be welcomed on Wednesday morning by AFL-CIO President, Richard Trumka. President Trumka was kind enough to spend close to a half hour talking about the importance of worker/labor culture and films in particular to expanding the story of labor’s ongoing battle for worker rights and dignity at work. You can watch Richard Trumka's speech by clicking the video to the side. This is a critical moment in the battle to save our American Labor Movement and the film festival organizers strongly felt that there is an important role to play in finding, promoting, screening and organizing festivals of every size and type in every corner of the country. These films will show workers everywhere that their fellow workers are fighting back against unfair wages and working conditions. They are organizing into unions and winning those union elections, despite the lies and distortions of the corporate controlled mainstream media. The whole group was able to see previews of new films under development from the Washington, DC based Doc in Progress - with new films on federal workers and programs designed to put former prisoners back to work in gainful employment. It was a special treat for the conference to attend one of the first national screenings of a moving narrative film, “Pride”, about a group of radical LGBT activists in 1984-85 England, who decide to go to Wales to support the miners in their epic battle against Margaret Thatcher’s attack agains the workers and unions of the UK. The film was charming and powerful and played to an enthusiastic and packed house. Our own Workers Unite Film Festival made many excellent connections with new activists and new films from around the country and the world, as did each of the attendees. 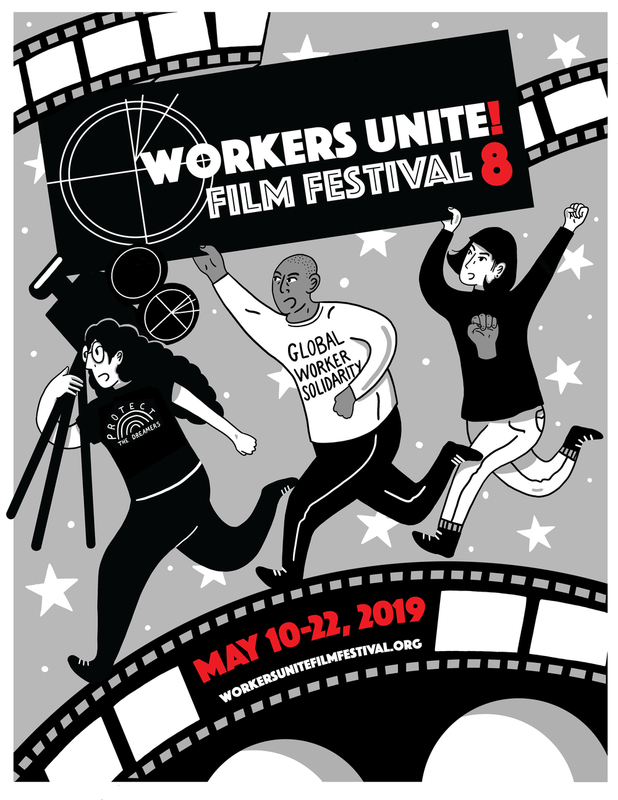 We are now working on plans to bring our whole labor film database to a wider audience and use it as the backbone for the upcoming Workers Unite online film festival (due by the end of 2015). Remember that if you want to submit a film to Workers Unite Film Festival 2015 then click here. We are already planning for co-produced events with several of our brother and sister festivals.